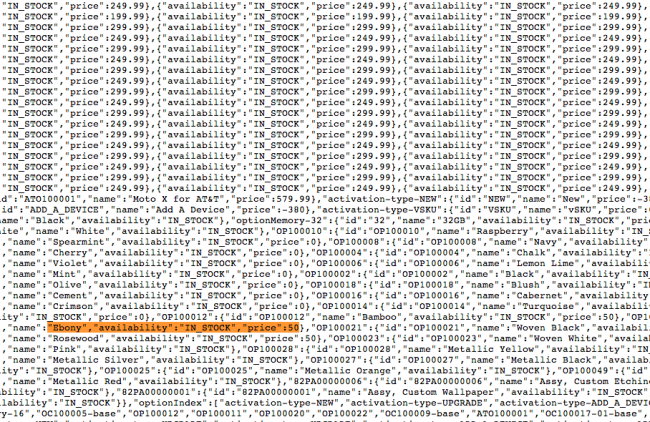 Are Moto X Wood Backs Going to Cost an Extra $50? Don’t worry, you aren’t alone in drooling over the picture above. We too want phones with beautiful, 1-of-a-kind wood backs. 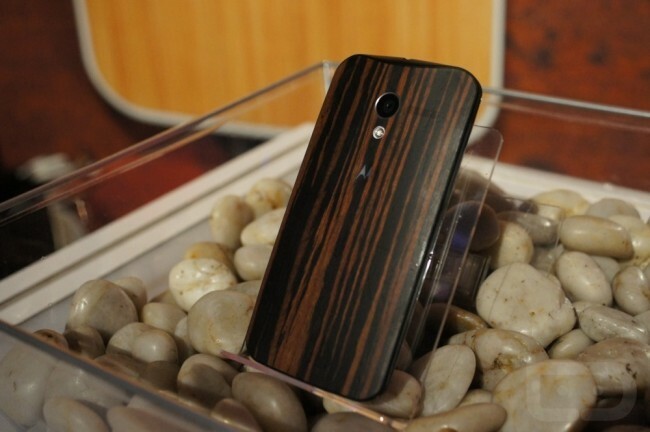 The Moto X will eventually have them, likely in Teak, Bamboo, Ebony, and Rosewood around Q4 of this year. We were able to snap photos of and handle a few of the early samples during the Moto X unveiling – boy are these finishes pretty. One thing we weren’t sure of is how they would be sold through Motorola’s MotoMaker software. Most of the MotoMaker process is 100% free to users, but when you start talking about raw, organic materials that will likely have challenges, you wonder if they should come at a premium. If the current MotoMaker setup gives us any clues, we could be looking at a $50 charge to go wood. As you can see in the pricing and option breakdown found currently on Motorola’s site (click the source link to see for yourself), you’ll notice an on-contract pricing structure for phones listed that starts at $199, but also includes price points of $249 and $299. You’ll also see the off-contract prices set at $579, $629, and $679. We know that the 16GB version of the phone is $199 on-contract and $579 off, while the 32GB is $249 on-contract and $629 off. So why the extra price point that’s $50 higher? Well, if you continue on down into the options section where the color choices of backs are listed, you’ll see items like Mint or Olive or Cement listed with at a price of “0” (“price” :0). 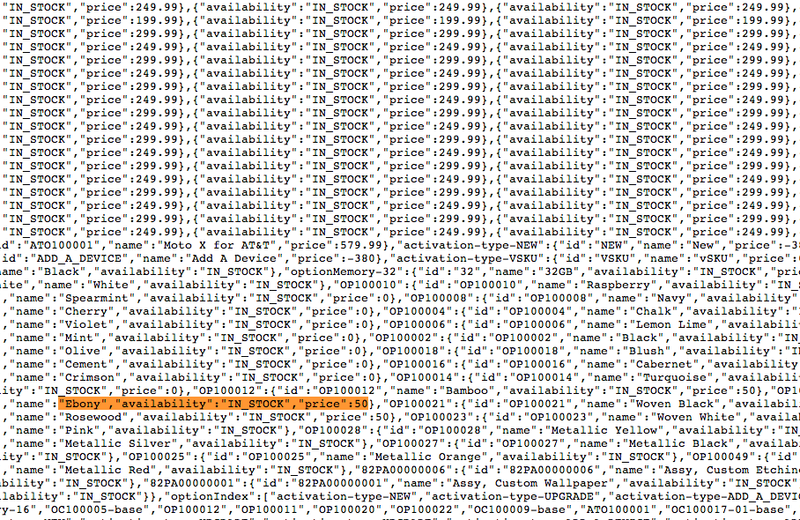 But if you continue looking for the wood options, which aren’t currently available, you’ll see a price of “50” (“price” :50). Now, this price is only next to the wood options (teak, ebony, rosewood, and bamboo) and not attached to any of the standard colors. So if you look at the phone pricing structure, we can only assume that this is where the extra $50 pricing comes in. In other words, you could get the 16GB for $199 with a standard back or $249 with a wood back. If you go 32GB version, you can buy one for $249 or $299. Same goes for the phones at full retail. While I would not claim to understand the manufacturing process for making the Moto X here in the States, I can imagine that sourcing wood, machining it, treating it, and assembling it onto a phone cannot be even close to as easy or cost efficient as it would be with a standard plastic back. If Motorola wants to charge extra for wood, I can’t say I’d be surprised nor would I be mad. This is by no means a confirmation that Motorola will charge $50 for wood backs, but something that was pointed out to us. We still have a couple of months to go before these become available. That’s an eternity in the mobile industry. Did the Motorola DROID 5 Just Make Its First Appearance?